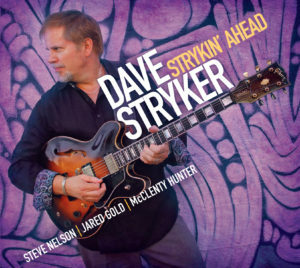 NOTES ON JAZZ: The Joyous Feel of Guitarist Dave Stryker on "Strykin' Ahead"
The Joyous Feel of Guitarist Dave Stryker on "Strykin' Ahead"
On his latest Strykin’Ahead the guitarist redeploys the musicians that he used so successfully on his Eight Track II album. The group includes Jared Gold on organ, McClenty Hunter on drums and Steve Nelson on vibraphone. Boy can these guys make magic together. From the cascading opener Stryker’s “Shadowboxing” to the beautifully realized version of Wayne Shorter’s classic “Footprints,” the arrangements and execution are nuanced and superb. Stryker knows the strengths of his fellow bandmates and he employs them with a deft precision. Nelson’s use of space and Gold’s light touch on the B3 are both exemplary. Stryker’s playing, almost non-chalant, is never flashy, always so confident and subdued that it can seem deceptively simple. But rest assured it is full of imagination. Hunter is that rare trapmaster who has dynamic propulsion, big ears and exquisite taste. Billy Strayhorn’s “Passion Flower” is given a brushed Bossa beat by Hunter, with Gold’s bass lines pulsing the music forward. Nelson and Stryker are musical soul-mates; both artisans in their ability to say so much with less. Stryker shines on another of his originals “Strykin’ Ahead,” the fleet intro- Nelson, Gold and Stryker all playing the rapid opening line with cool precision. With the gurgling pace provided by the driving Hunter, Stryker’s notes just fall from the guitarist’s fretboard like raindrops from a cloud. There is a stream of consciousness feel to the way he attacks his notes, a consistency that produces a smooth organic flow. When this group gets into a groove their cohesiveness is a pure delight. With guitarists, there is always room for a blues and on “Blues Down Deep” we get a little window into where it all began for Stryker. No flash here, just an economy of notes played with a sustained sense of emotional depth, following in the footsteps of some of his idols. Gold has a marvelous control of his B3, producing sounds that are juicy with pathos and Nelson’s vibes resonate with bluesy authenticity. The remainder of the set includes Clifford Brown’s “Joy Spring,” the Broadway hit “Who Can I Turn To” -where Stryker uses some Montgomery-like octave work-, and Parker’s tangled “Donna Lee,” which Stryker conforms to his slipstream style of playing. Strykin’ Ahead is an immensely satisfying album that should firmly establish Dave Stryker into the elite ranks of jazz guitarists working today.